Win A Veggie Tales Prize Pack! VeggieTales has a new DVD & CD coming out and in celebration we are giving away a portable DVD player and a copy of both new releases! 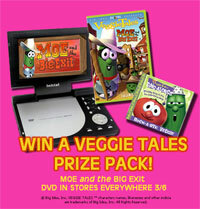 Moe and the Big Exit on DVD AND Rock-A-Bye-Veggie on CD!! Here is a little bit about both titles… Yippie Yah Yo Cowboys! Slip on your boots, round up the horses, and lasso in some learnin'! Everyone's favorite vegetables are ready to have some cowboy fun offering a unique and highly entertaining twist on the classic story of Moses and the Exodus. Moe and the Big Exit out on DVD! Visit this site more information. And, VeggieTales new CD release…Rock-A-Bye Veggie is a collection of 15 well-loved lullaby classics performed by everyone's favorite produce.